If you've been wanting to create a website business so you can work at home in Ecuador, make it happen with SBI, a company that teaches you how to build your own website business. Hundreds of SBI sites are among the top .05% of all websites. Many more rank in the top 3%. And guess what? Pro-Ecuador.com ranks among the hallowed hundreds in the top .5%. I was at a seminar in the United States when one of the speakers gave a talk about SBI. I didn't hesitate and neither did Gary. It had the ring of truth and we decided to go for it. We signed up immediately, even though neither of us had any experience in creating a website business. A few weeks later found ourselves moving to Ecuador with no jobs and very few contacts. 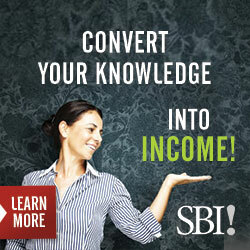 As we had intuited, SBI turned out to be the perfect way for us to work at home in Ecuador. Have you got a super idea for a site, plenty of enthusiasm, but aren't sure what to do after that? SBI is very likely the answer to your prayers. You can create a website business, just as we have done. Take the Site Build It! Quick Tour to see if SBI has the tools you need, or watch this 3-minute shortcut below. 98% of all new websites fail--hundreds of thousands of them. Think of all the millions of hours and dollars wasted. Why this almost total failure rate? A pretty site, great content, even plenty of traffic isn't enough. You must have the right marketing and monetization tools to turn your traffic into eager-to-buy customers. Then you must artfully weave all of this together into a cohesive, effective, income-producing machine. Unless you do, your website is nothing more than a hobby. It's more like a dusty shop in a dark alley with cobwebs growing over the door. But which tools are the right tools? There are a mind-boggling array offered online every day. Promises of quick riches lure us into buying tools, strategies, apps we don't need or that have little value. SBI is vastly different. It's method of teaching is a simple, instructional, 10-day program. You progress through the clearly-defined steps at your own pace. There are videos, charts, personal experiences and easy-to-understand explanations all along the way. Even experienced webmasters use SBI. With everything they need in one company, they don't have to spend extra money on additional tools. If you still have unanswered questions after you've checked out our SBI links, you can contact an SBI advisor. No free time to devote to creating your own website? Not to worry. SBI Services has experts who will build an SBI site for you. SBI offers a terrific 90-day money-back guarantee. You can study the SBI guide, work with the tools, interact with thousands of SBI users on SBI's excellent forums or get assistance from SBI's team of experts with more than ample time to make up your mind. You can create a website business of your own. It takes dedication and work but SBI is there to help every step of the way. By the way . . . If you currently have an active website and don't know your ranking, aren't you even a little bit curious? Take a peek at your website ranking as compared to all others. A low ranking may motivate you to sign up for SBI like we did. Return from Create a Website Business Like Pro-Ecuador with Solo Build It to the Pro-Ecuador.com home page.